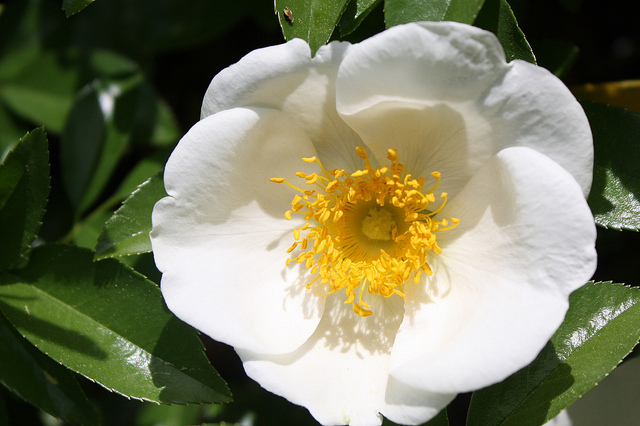 The name "Cherokee Rose" is derived from the Cherokee native American tribe-, who widely distributed the plant. The flower is waxy white with a large golden center surrounded by vivid green leaves. 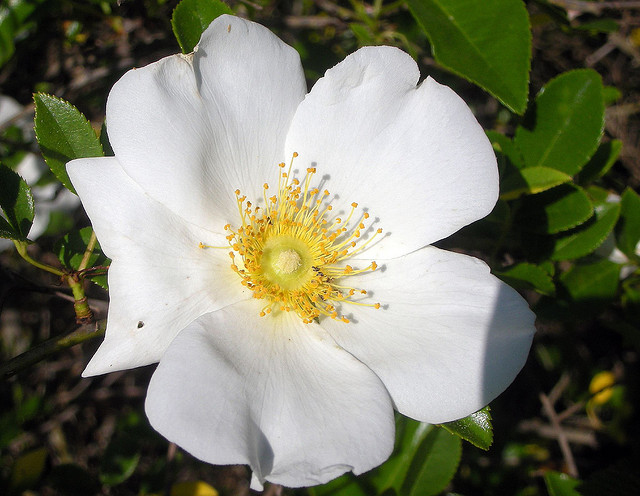 The Cherokee rose is a hardy plant with a profusion of thorns, blooming in early spring (with sometimes a second flowering in the fall under favorable conditions). The rose has been around for about 35 million years and grows naturally throughout North America. Roses are red, pink, white, or yellow and can have a wonderfully rich aroma. The petals and rose hips are edible and have been used in medicines since ancient times. Rose hips (the fruit of the rose which forms at base of the flower) are eaten in winter by wild birds and other animals. Roses have played an important role in myth, history, and poetry from ancient times to the present. The rose is our national flower and the state flower of New York. The Oklahoma rose is a symbol of Oklahoma, and the wild prairie rose is the state flower of Iowa and North Dakota. State Flower of Georgia: Cherokee Rose; photo by Judy Baxter on Flickr (noncommercial use permitted with attribution / share alike).